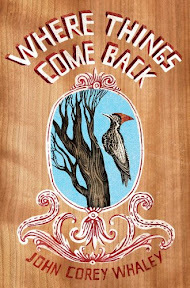 Where Things Come Back [Book Review] – my books. my life. I first heard of this book through Ginger from GReads. And if you know Ginger, you know that when she loves a book she makes sure the whole world knows it. When it won the Printz Award, it came back on my radar and I decided to finally give it a shot. So based on these recommendations, I had somewhat high expectations. But I guess I didn’t really know what to expect. I actually thought it would be a younger book than it is, almost middle grade, but it’s definitely mature enough for the young adult designation. The main character, Cullen, has a unique voice. His narration hints at Holden Caufield or Sal Paradise without actually emulating them. You just really feel like you’re in his head. Alternating chapters with Cullen is the story of Benton Sage, a young missionary who loses his way, and Cabot Searcy, his college roommate who tries to find it. Things sort of happen and I wasn’t really sure where they were going or how they made a cohesive story but by the end, it worked. Overall, this wasn’t the amazing book I thought it might be, but it was different than anything else I’ve read and is definitely worth checking out. Others’ Thoughts: Helen’s Book Blog; Reclusive Bibliophile; GReads! I had not heard of this book before, but some of the things you mention in the synopsis sound quite interesting. It does sound as if the execution was off a little though, and I am sorry that you didn’t enjoy this one as much as you had hoped to. I always seem to have a problem with books that are too hyped because often, they seem disappointing to me. This was a very thoughtful and candid review, and I enjoyed it. Thanks for sharing it! That is funny, because just by looking at the cover, I would think this was for middle grade readers. See, that will teach me!